Observation is carried out by activists of the Belarusian Helsinki Committee and the Human Rights Center “Viasna” in the framework of the campaign Human Rights Defenders For Free Elections. Observation results are processed on a daily basis and constitute a representative sample (observation covers 3.04% of the 5,971 polling stations). These data allow observers to estimate the basic tendencies of early voting. The below information was processed based on data received from 182 polling stations as of 23:00, September 9. 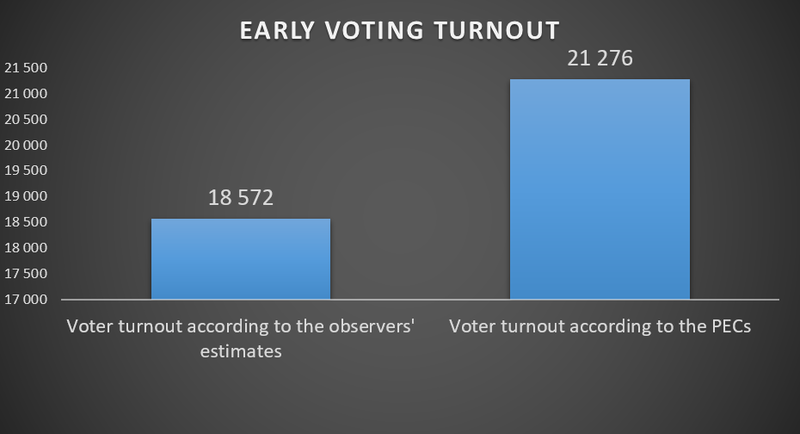 According to the campaign’s observers, the number of voters registered during the fourth day of early voting amounted to 18,572 people, while the PECs’ protocols claimed there were 21,276 persons. The difference amounts to 2,704 people, or 12.7%. In the 2012 parliamentary elections, the difference was 6.5% based on observation at 150 polling stations. An unprecedented difference between the PEC data and the observers’ estimates was documented on September 9 at polling station No. 9, electoral district No. 32 in Homieĺ, where, according to the PEC, 584 people voted early, while, according to the observers, only 106 voters came to the polls. In PEC No. 1, DEC No. 35 Homieĺ, 125 people voted according to the PEC, with only 56 voters according to the observers. 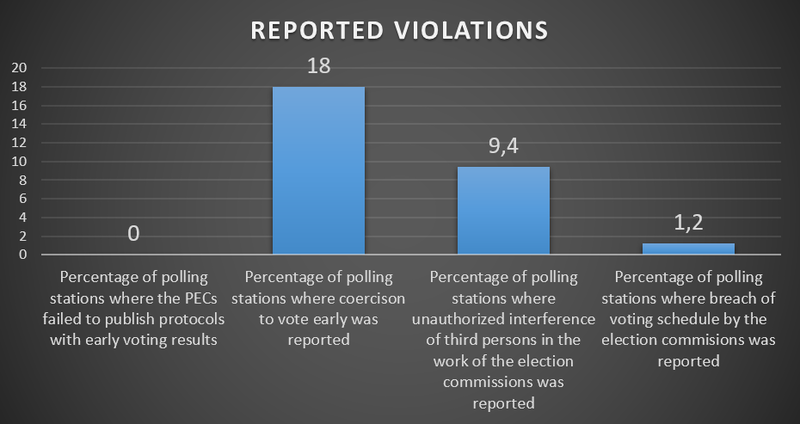 Large discrepancies between the numbers in the official protocols and the data reported by the observers were documented in the following polling stations: PEC No. 91, DEC No. 93 in Minsk (PEC data — 115, observers’ reports — 25); PEC No. 420, DEC No. 103 in Minsk (128 and 33, respectively); PEC No. 10, DEC No. 72 in Maladziečna (183 and 114, respectively); PEC No. 22, DEC No. 84 in Mahilioŭ (236 and 77, respectively); PEC No. 11, DEC. No. 84 in Mahilioŭ (183 and 114, respectively); PEC No. 29, DEC No. 2 in Brest (249 and 68, respectively); PEC No. 21, DEC No. 5 in Baranavičy (224 and 154, respectively); PEC No. 10, DEC No. 5 in Baranavičy (131 and 46, respectively); PEC No. 8, DEC No. 6 in Baranavičy (219 and 72, respectively); PEC No. 28, DEC NO. 6 in Baranavičy (141 and 41, respectively); PEC No. 17, DEC No. 42 in Mazyr (255 and 155, respectively). In general, the difference between the PEC data and the observers’ reports on voter turnout was documented at 54.8% of the polling stations covered by the observation. Just like in previous election campaigns, the observers report massive coercion of students and other citizens to vote early.